Kelley Paul, Sen. Rand Paul’s wife, wrote an open letter to Sen. Cory Booker on Wednesday explaining what it’s like to be on the receiving end of harassment, which the New Jersey Democrat has encouraged. Having experienced intimidation, threats, and even physical violence, Paul explains to Booker what their life is like right now. Sheriffs are doing extra patrols by their home ever since their address and phone number were doxxed along with other GOP senators in recent days; she sleeps with a loaded gun by her bed; and they have had to expand their security systems. “In the last 18 months, our family has experienced violence and threats of violence at a horrifying level,” she explained. 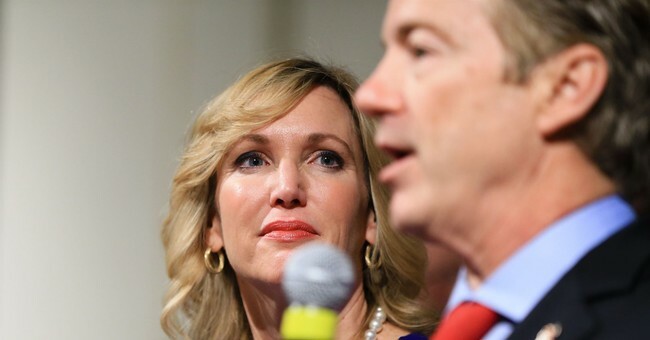 While she was relieved Rand was OK after the shooting at a congressional baseball practice last year, she watched her husband struggle to recover after being physically assaulted in their yard last November, which resulted in six broken ribs, lung damage, and multiple bouts of pneumonia. Then, the serious attack became a joke to politicians and pundits alike. Kentucky's secretary of state, Alison Lundergan Grimes, recently joked about it in a speech. MSNBC commentator Kasie Hunt laughingly said on air that Rand's assault was one of her "favorite stories." Cher, Bette Midler, and others have lauded his attacker on Twitter. I hope that these women never have to watch someone they love struggle to move or even breathe for months on end. She called on Booker to reconsider his advice to supporters a few months ago to “get up in the face of some congresspeople”—as Rand experienced just this week at the airport. "Preventing someone from moving forward, thrusting your middle finger in their face, screaming vitriol -- is this the way to express concern or enact change?" she asked. "Or does it only incite unstable people to violence, making them feel that assaulting a person is somehow politically justifiable?"